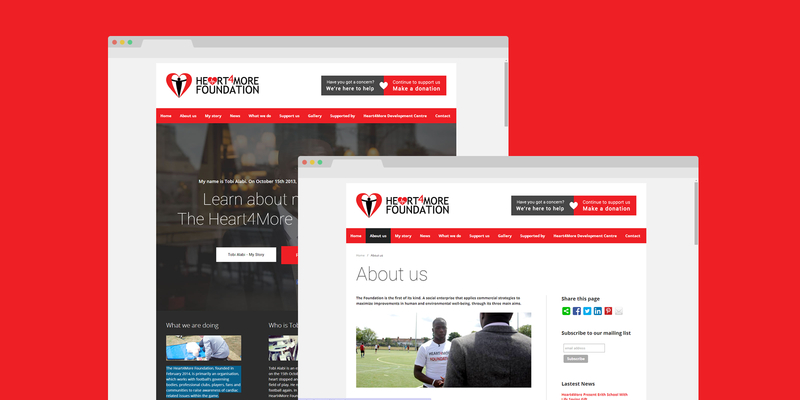 As part of our partnership with Spotlight Telecoms we provided a free website as part of our charitable contribution to the great work Heart4More Foundation are doing - saving lives. On October 15th 2013, at the age of 19 Tobi Alabi almost died playing football, the game he loves. Following this on February 2014 The Heart4More Foundation was founded & is primarily an organisation to raise awareness of cardiac related issues within and outside the game of football. 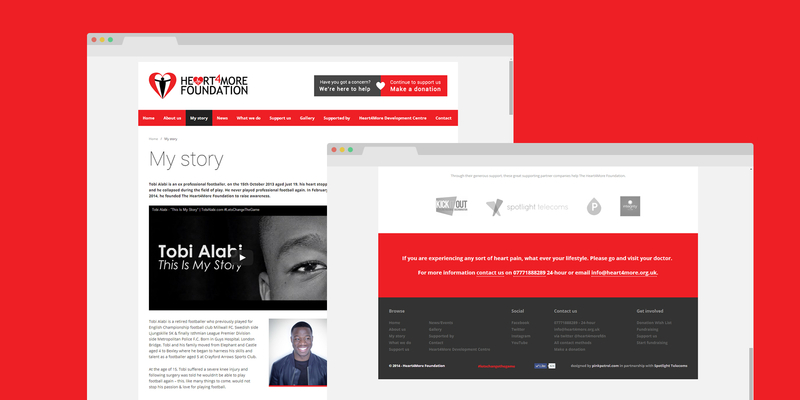 As part of a charity donation we designed & developed a WordPress website pro-bono to help the Heart4More Foundation establish themselves as a key driver for heart screening in and outside of football. We worked closely with another client Spotlight Telecoms to further help Heart4More Foundation. Using WordPress as the content management system we built the website so it could be content managed as easy as possible. We developed a range of specific page templates with various layouts to enable important content to be displayed in the best possible way. We branded a range of social media platforms such as Twitter, Facebook & YouTube. It was important that the different social media platform were branded to ensure brand integrity and important communicated the same messages across the platforms. Working with Heart4More we held a series of workshop where we would brain storm ideas, way to display content and important raise awareness. An idea that came to fruition was the idea of a donation board where companies & person would donate items they needed as well as services they could offer. Simplifying the CMS even more! We looked at ways to make the content management aspect of the website as easier as it can be. One way we did was way connect the gallery area of the website to the social media platform Instagram, which enabled the foundation to update both platforms instantly, on the go without any difficulty. The website we created now matches the professionalism of the people raising awareness. The new website has been received so positively that it has created more opportunities. The Heart4More Foundation continue to raise awareness and the website has become the first point of call for the foundation. We are proud of what we have produced and we are pleased to support what we think is a fantastic cause and we will continue to do so. "We cannot thank the PinkPetrol enough for all the hard work they have put into the website. We have the web presence & the platform now to open doors and essentially save lives through awareness."